I love visiting our local food salvage store! You just never know what you will find, but the savings on Pepperidge Farm baked goods (2 loaves for $1) make it worth the trip. When I originally posted this photo, many readers wrote to ask me where they could locate a salvage store in their own areas. I would ask a local grocer or the person re-stocking the shelves with bread...all the dated food is going somewhere, and it's not necessarily the dumpster! Alternately, you can check the yellow pages for Food, Salvage or Bakery, Thrift. 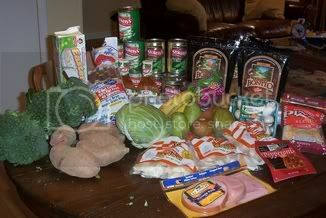 Amy Dacyzn from The Tightwad Gazette first introduced me to salvage food shopping. Her research found that the savings vary from state to state, as laws in each differ. Happy hunting!